The furthest visible horizon in ancient Egypt, where prehistory meets history, has always been an area of tantalising fragments, both literally and metaphorically. It is little wonder that students of Egyptology, particularly newcomers to the subject, tend to cluster around the well-documented periods of the Old and New Kingdoms. 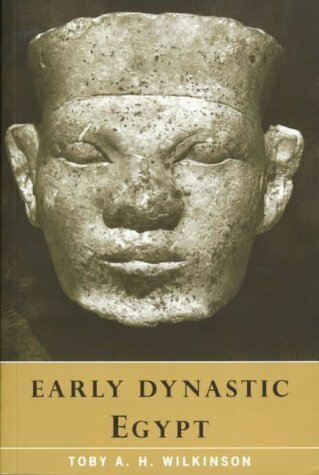 Wilkinson’s book sets out to prove that Early Dynastic Egypt (deliberately capitalized) has as identifiable an Egyptian character as any other; and that, after a century and more of research, the "interface" between predynastic and dynastic Egypt can be seen to be neither as radical nor as rigid as was proposed in the past. By chapter 2, we have already finally done away with terms such as "Archaic" to describe the prehistoric/ proto-historic/historic transition period of Egypt’s history, which thus loses its awkwardness; the first three dynasties are shown to have more in common with each other than with the Fourth to Sixth Dynasties (pyramids are apparently the common language separating them); and the reader will have recognised that he is being led by an author whose depth of knowledge and confidence with the material is such that he can be trusted. The historical outline returns to a more familiar approach but here again the detailed references mark the text out from others dealing with the same period. And then, the fly enters the ointment on page 125 with the news that "Ink inscriptions on pottery vessels from the late Predynastic period make it clear that, right from the beginning of the Egyptian state, taxation was levied separately on the two halves of the country." It seems that no matter how far back one flees into history or prehistory, that old devil taxation is waiting. This just highlights the sophistication of the ancient Egyptian administration system which is scrutinised in a very useful chapter to itself, showing the complexity of collection and distribution of goods and services in early Egypt. Foreign relations – both trade and raid – are covered too. Wilkinson argues at the end of the book that "Early Dynastic Egypt" has come of age. This is true; the absence of formal records on a scale known from later times simply proves that a society can flourish and be successful – and leave its mark - without them. Greater skill is needed in reading the images and artefacts that do remain, but it is possible. However, the fewer the records, the greater the temptation to view ancient times in the context of our own experience. This seems to be an inevitability in the study of history, that each new generation will reinterpret the evidence in the light of what it knows and understands. For the past fifty years, views have moved towards socio-economic approaches to history and archaeology. How will the same evidence be viewed in another fifty years? 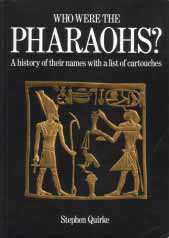 This is an "absolutely must have" for any Egyptology bookshelf. To illustrate this fact, let’s begin with the last section first. This is a list of the principal names of the kings of Egypt, set out in cartouches, with a brief biography of each one, right from the First Dynasty through to the Ptolemies and subsequent Roman emperors. Apart from the obvious interest of the Egyptology student in the names and biographies of kings dating back over 5,000 years, knowing, through naming, gives us an intimate link with the past that is often missing in other areas of archaeology. Myth and legend have to fill the gaps in cultures with an oral tradition that has been broken; however, the tradition can be just as rich, and there is no guarantee that a written tradition is always reliable or truthful! The names of the early recorded kings, in serekhs or cartouches, are easily identified, and it can give a great boost to a student’s confidence to be able to spell out the letters of Snofru or Khufu, and thus make their own first personal link to the Egyptian past. Listing in this way also makes the idea of continuity accessible, although it would be incorrect to assume that the Egyptians saw history as a linear development moving from one monarch to the next. This might have been expressed in linear form, for convenience, in king lists, but it is not necessarily how the ancient Egyptians saw history. At this point, let us return to the start of the book and gain some insights into what names meant to the Egyptians. Names had magical potency, incorporating, as Quirke writes, the identity of the individual or being or item. The knowledge of an individual’s name gave power. The five principal titles of the king, the personal name and the royal and throne names, are then described in terms of their symbolism and imagery. "The King stood between gods and men, with the power of gods but the mortality of mankind." The immense stability and potency arising from the names of the king might have masked, in later times, a reality that was far from secure, but the idealised security represented by royal power remained in the popular imagination. "During periods of strong central authority people often named their children after the man on the throne in a display of loyalty, and to secure the divine blessing of an effective king… Close devotees even kept the cartouche around the royal name within their own." The book goes on to examine variations due to dynastic, political and social change, before concluding with the section listing king’s names with biographies. "Modern books and scholarly articles on ancient Egyptian religion are probably adding to the original body of thought as much as simply explaining it in modern western terms. We, as scholars, are now unwittingly and usually unthinkingly carrying forward the evolution of Egyptian religion," writes Barry Kemp in the introduction to this book. 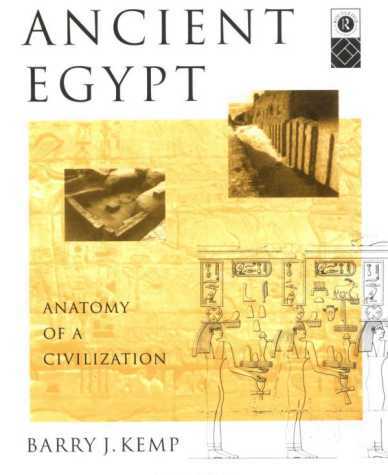 The introduction is an essay on the philosophy of Egyptology. The diligent reader is given the clue to the approaches to the subject taken therein. The emphasis on economic and social aspects of life will not please people in search of mummies, gold, kings and battles. Nor will its underlying belief that the subject of "ancient Egypt" is the construct of the modern mind. "..throughout our lives our imagination hovers all the time between taking in and interpreting reality and heading off into worlds of myth and fantasy. I am aware as I write this book that I am creating in my own mind images that I hope correspond to the way things were in ancient Egypt. I also know that the more I try to make sense of the facts, the more what I write is speculative and begins to merge with the world of historical fiction, a modern form of myth." 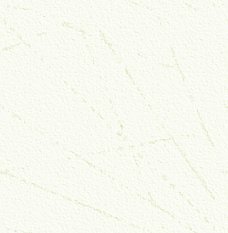 We should, as students of the subject, be aware that each of us sees "our ancient Egypt" in unique and individual terms which may or may not correlate to the real thing. It is not just the fantasists who see themselves as re-incarnations of some great king who are guilty of this, nor those who believe that aliens built the pyramids. This is the hardest lesson of all for the new student to learn. Two themes emerge strongly in the book. The first is that it might have pleased the founders of Egyptology to view ancient Egypt as an "inherently conservative society", and that it might please us to do the same, but in fact, tensions and change within society were constantly and ingeniously dealt with by the ruling elite to give a lasting impression of permanence and immutability. "In later periods, when new elements appear, such as the popularity of the domestic god Bes from the New Kingdom onwards, or the huge interest of the Eate Period in sacred animal burial, we are entitled to suspect a derivation from within popular consciousness and behaviour: folk culture surfacing only when taken up by official patronage and made explicit and visible in sources that we can understand." This idea of tension, and duality, is apparent in several images of the gods Seth and Horus. Secondly, that the ancient world contains the seeds of the modern world: "I switch on my television set, and the news bulletins bring into my home scenes of presidential motorcades on thronged boulevards, excited crowds cheering a leader at the balcony of a palace built in antique style, public acts of worship and homage performed in strange costumes. I watch, in other words, re-enactments of the lives of Bronze Age rulers." Intellectually, we like to believe that we are living in the 21st Century AD (or equivalent). Emotionally and spiritually (a much misused and misappropriated word) we are living in the Bronze Age (and physiologically, we might add, we are still on the Serengeti). As stated earlier, Kemp's thought-provoking approach will not please everyone. At Amarna he is on home territory and if there is evidence of self- indulgence in terms of interpretation it is justified. With reference to Akhenaten's attempt to focus adulation directly onto himself, he concludes: "Akhenaten's kingship provides an unintended caricature of all modern leaders who indulge in the trappings of charismatic display. The Egyptians them selves did not like what they saw. It evidently offended their sense of good taste." And the monarchy was "wrapped again in the shrouds of high theology." If this review contains a number of quotes, there is much worth quoting. The student in search of the roots of ancient Egypt, the predynastic and early dynastic foundations of the state, will find a wealth of information in the earlier chapters, too.